Mix all the ingredients in a bowl except oil. 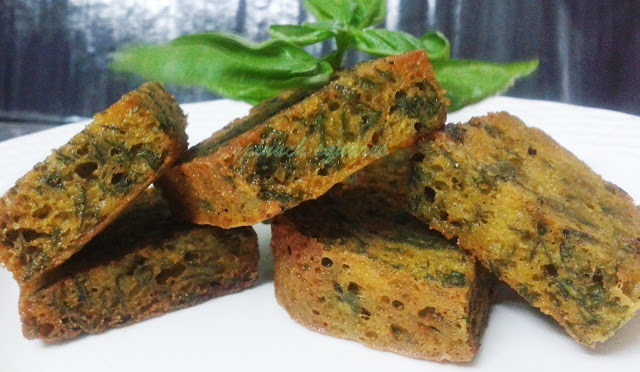 Add 1/2 to 1 cup water to make a thick batter like you make for dhokla. Mix well so that there are no lumps in it. Grease a tupperware box with little oil and pour the batter in it. Keep the box in microwave on high for 4-5 minutes till all the water evaporates and you get a firm sponge. Let it get cool then take it out. Cut in desired shape and size and deep fry in hot oil till it is crisp from both the sides. You can make it hours before serving and fry at the time of serving. Beat hung curd along with milk or water till it becomes smooth. Peel, wash and finely chop onion. De- seed tomato,cucumber and chili and chop them as well. Add chopped veges to the curd and mix well. Keep the curd in the fridge till the time of serving. Add salt while serving and mix well. 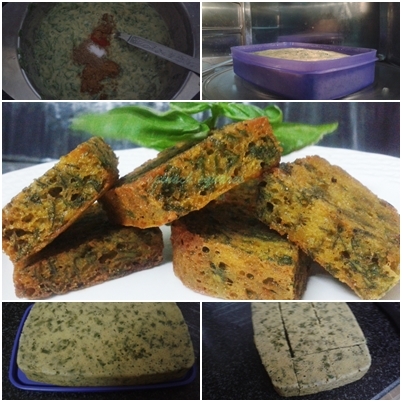 Sprinkle roasted cumin powder and degi mirch powder and serve chilled. Heat oil in a pan and crackle cumin seeds, then add ginger,garlic and onions and cook till the onions become translucent in color. Add pureed tomatoes, and cook till the masala leaves the sides of the pan. Now add 1 cup water , cashew paste and all the spices and salt. Simmer the gravy on a low flame till you see some oil specks on the top and the gravy thickens. 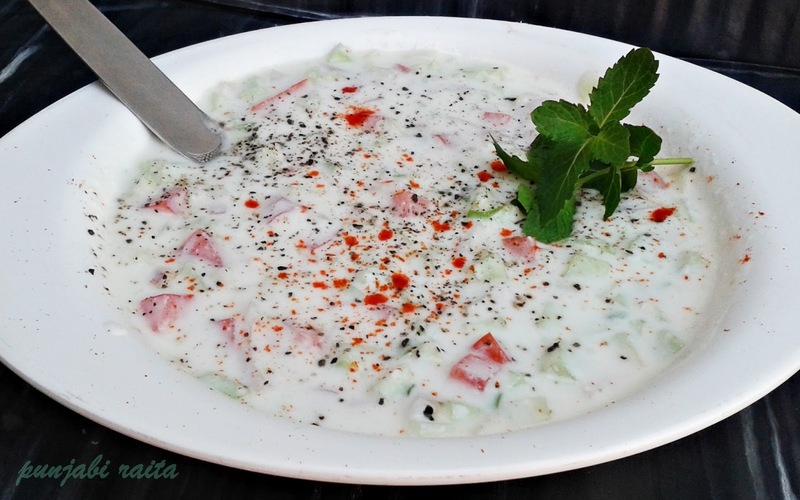 Add ketchup, kasuri methi, and cream. Stir till the cream is mixed evenly with the rest of the gravy. Switch off the gas. Mix crumbled or grated paneer , chopped raisins, chopped cashews, green chilies, chopped coriander leaves in a bowl. Add degi mirch powder, sabzi masala and salt and mix well. Slice the paneer in desired shape and slice each piece into two halves gently. Now place some of the stuffing on the paneer slice and cover it with the top slice gently. Press gently. Make all paneer sandwiches stuffed with the filling this way. In a bowl, make a paste of cup corn starch with 4 tbsp water. Dip the paneer sandwich in the batter. Turn over and coat from all sides and place the pasanda sandwiches in a medium hot oil on a griddle pan for shallow frying and cook from both sides till brown in color. Now drain the fried paneer sandwiches on paper towels. keep aside. Now place the pasanda sandwiches in the gravy. 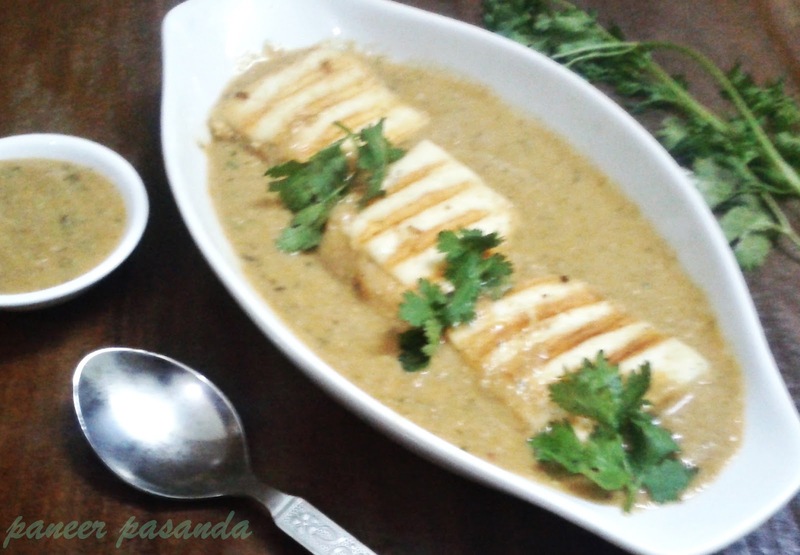 Coat the paneer pasanda in the gravy. Serve paneer pasanda hot garnished with some coriander leaves with naan, tandoori roti, chapati or paratha. handful of dry fruits as per choice like raisins,almonds, pistachios, cashews,chirongi etc. Soak barnyard millet or sama ke chawal in enough water for about an hour. later drain and keep aside. Heat milk in a thick bottomed pan and bring it to a boil on a low to medium flame. Add the sama ke chawal. stir well. Cook on a low flame till the barnyard millet gets cooked.Do stir at intervals. 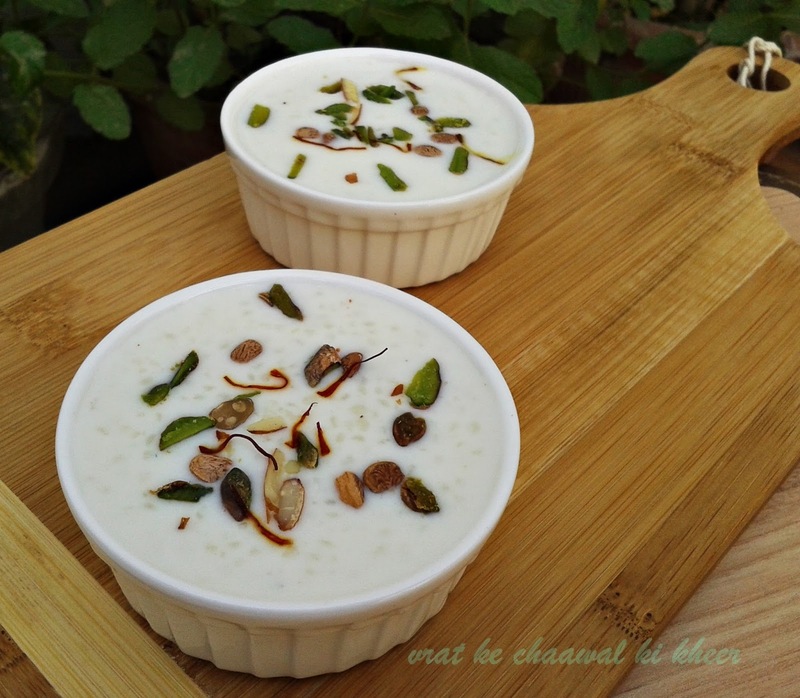 Scrape off the dried milk solids from the pan and add it to the kheer. It will take about 18 to 20 minutes to cook on a low flame. Add sugar and stir well till the sugar dissolves. Add chopped nuts ,stir and simmer for a minute. Serve the vrat ke chawal ki kheer hot or warm garnished with some saffron threads or chopped nuts or you can also serve this kheer chilled.